We are thrilled to announce the first Adventure’s of Jamear Workshop. An end of the school year activity fair, this free workshop/event will offer math-based crafts, games, and activities for Club and non-Club members. 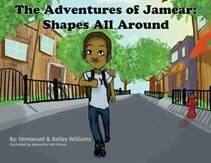 This workshop is inspired by the book The Adventures of Jamear: Shapes All Around and will be led by the authors Immanuel and Kelley Williams. Register at the front desk at any Clubhouse or call us at any of the numbers in the footer below. Contact: Immanuel Williams at immanuelwilliams@gato365.com for more information. Volunteer: If you are interested in volunteering for this event, let Immanuel know.